In the eyes of many technology lovers, the tablet market has become somewhat tame and predictable in recent years. New models are rarely greeted with the same excitement generated by the debuts of the original iPad or the Nexus 7. 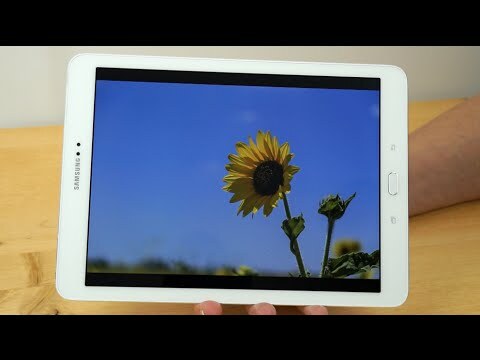 Samsung tablets, in particular, seem to be stuck in something of a rut. Fortunately, the mobile giant is looking to shake things up with the highly anticipated Galaxy Tab S2. In terms of overall look and feel, the Galaxy Tab S2 is reminiscent of the latest iPad. It boasts a sturdy metal frame and moderately beveled edges. The 8-inch variant weighs in at 9.4 ounces while the 9.7-inch model is 13.8 ounces. In a tablet comparison between the iPad and the Galaxy Tab S2, Samsung’s newest tabs stack up favorably since they’re both lighter and thinner than competing Apple tablets. As far as I/O ports go, the Galaxy Tab S2 features a microSD slot with a 128GB capacity, a microUSB socket, and the standard stereo jack. Cameras include an 8MP rear unit as well as a 2.1MP front-facing lens for crisp video chats. Both models boast 2048×1536 Super AMOLED displays ensconced in the standard bulletproof Gorilla Glass. The 8.0-inch model has 320 pixels per inch while the 9.7-inch unit is good for 264ppi. The Galaxy Tab S2 line is powered by two separate quad-core processors clocked at 1.9GHz and 1.3GHz, respectively. Available RAM is a beefy 3GB, which allows for solid multitasking and graphics performance. Consumers have the choice between 32GB or 64GB of on-board storage. Total storage space can be up to 192GB with the right SD card. The 8.0-inch model has a 4,000mAh battery while its big brother boasts 5,870mAh per charge. The current operating system is the full-featured and well-received Android 5.0.2 aka Lollipop. While the default interface is the polarizing but familiar TouchWiz UI, Samsung has wisely kept nuisance apps to a minimum. Custom apps like SideSync and Quick Connect allow users to control other Samsung products remotely and throw video to smart TVs. Compatibility with the Book Cover Keyboard and a free copy of MS Office make either Galaxy Tab S2 a serious productivity machine. Both Galaxy Tab S2 tablets feature the expected 802.11 a/b/g/n/ac dual-band MIMO Wi-Fi as well as Bluetooth 4.1 BLE. There’s also GPS, GLONASS and a compass baked into the cake if you like to wander off the beaten path. As far as mobile data is concerned, either model will run on pretty much every LTE, 3G and 2G network available from the major carriers. Though tablet comparisons are inherently subjective, the Galaxy Tab S2 distinguishes itself from its rivals in several ways. First off, it’s the thinnest tablet available bar none. Secondly, it arguably boasts the best display around at the moment. The only noticeable downside of the Galaxy Tab S2 is its somewhat lackluster battery life. All in all, it’s one of the most appealing tablets that can be had at present for the money.